TOKYO -- Toyota last week spelled out a plan to virtually end deployment of traditional gasoline engines by 2050. Now comes the hard part: getting its network of suppliers, dealers and customers onboard with the strategy. Executives who unveiled the plan concede even a company as big and rich as Toyota can't meet such targets alone. "Without support from all quarters, it will not be possible," Senior Managing Officer Kiyotaka Ise said at an Oct. 14 environmental forum where the automaker outlined the goals. Toyota targets a 90 percent cut in average carbon dioxide emissions from new vehicles by 2050, compared with 2010 levels. The vision relegates the traditional internal combustion engine to just a sliver of Toyota's total deployment by 2050. Instead, Toyota will load its future lineup with hydrogen fuel cell vehicles, gasoline-electric hybrids and electric cars. Also, Toyota aims to achieve zero carbon dioxide emissions at all factories in the same time frame. "We are confident we can achieve this," Ise said. "We have gone through a lot of calculations to get these figures." The shift will reverberate far down the supply chain for companies tied to traditional engine components ranging from piston rings to valve springs. Meanwhile, Toyota wants to root out carbon dioxide from not only the energy powering its factories but also the production of the raw materials used by Toyota and its suppliers. The company will start by issuing new guidelines to Toyota group suppliers in January, said Managing Officer Tatsuro Takami, the company's chief officer for environmental affairs. "We will be creating supplier green guidelines for carbon dioxide reduction and coexistence with nature," Takami said. "The entire group is going to come together for this kickoff." Winning over consumers is part of the challenge. Hybrids and fuel cell vehicles account for only a small slice of today's global sales. But Toyota now plans to sell 30,000 fuel cell vehicles and 7 million additional hybrids by 2020. Toyota must slash the cost of electrified drivetrains to make hybrid and fuel cell cars affordable, said Ise, who noted that Toyota achieved cost reductions in the fourth-generation Prius hybrid going on sale in December in Japan. "That is how we plan to increase sales," he said. 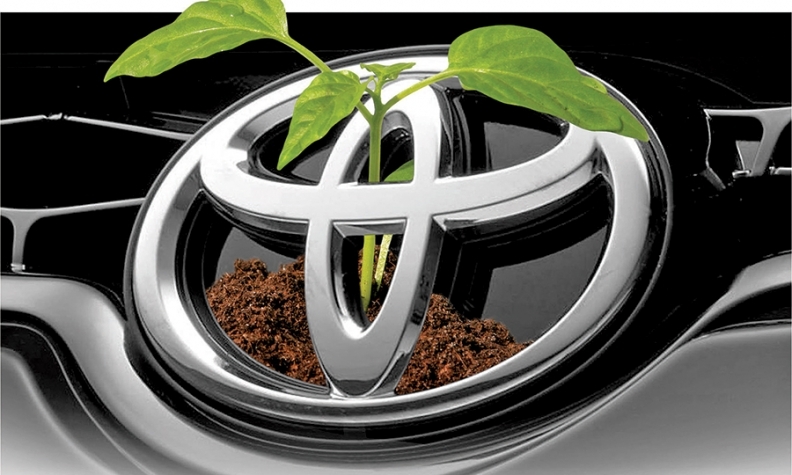 Meanwhile, Toyota aims to slash carbon dioxide emissions to zero "at all plants" by 2050. Compact and more efficient manufacturing processes will reduce reliance on fossil fuels. Remaining needs will come from renewable resources and hydrogen to "completely eliminate" carbon dioxide emissions by 2050. Japan's biggest automaker needs to set a long horizon for the changes to align suppliers, customers, government policymakers and even its own company toward the new goals, said Tatsuo Yoshida, an auto analyst at Barclays Securities Japan. "Toyota is such a huge organization, they have to have a flag to show the way they are going. ... But the difference is Toyota almost always delivers," Yoshida said.